I just wanted to say hello and to thank you so much for everything you have done for us. I have never seen anyone work as hard as you. When Per showed me the keys on Friday night, I totally freaked out in the IKEA store 🙂 We are starting to move today. I just wanted to send this to you before all the moving chaos begins and to let you know that I haven’t forgotten the hard work you did. We can’t begin to thank you enough for all of your hard work and patience the last few months. It was along & stressful journey but we finally made it! We can’t wait to get settled in & begin our new life! The Torelli team is the BEST! And we have definitely spread the word in our neighborhood! 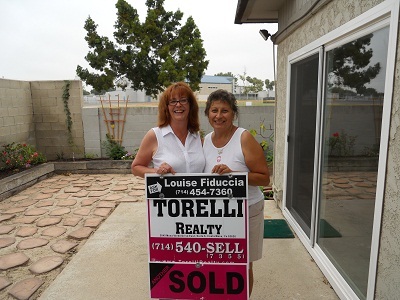 Realtor Louise Fiduccia with a happy seller! -I wanted to thank you (Louise Fiduccia) for all your hard work and dedication in finding me a new home. I was with two different real estate agents before I met you at that open house. You earned my business quickly with your market knowledge and persistence. You always got back to me in a timely fashion and made yourself available at short notice. I know I wasn’t the easiest client to work with but you hung in there and we got to the end result. I’m very happy with my new home and I owe a majority of it to you. I will recommend you to all my friends and family. Thank you again for all your help! -In our world today we get lost in the hustle and bustle of work and family and trying to keep up with ever changing changes. Today we want to take the time to let you know about one of your employees, Tracy Wilson. We have lived here in Costa Mesa most of our lives and have experienced many Real estate agents. None have met our expectations like Tracy. She has perseverance, knowledge of area, promptness for appointments,ability to know to not just sell something to sell it,and her best attribute is her personality and people skills which are hard to find in an employee today. So in closing we want you to know we most definitely would use Tracy Wilson for any of our future purchases. -Thank you so much for all your help in buying our lovely new home. Lending us money, babysitting and unpacking my kitchen are truly “full service” benefits of Torelli Realty!! You were a joy to work with and I can´t thank you enough. We will surely refer you to anyone. 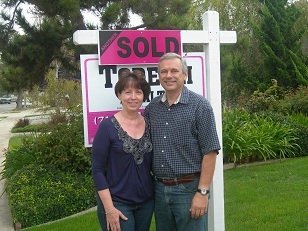 -Matt and I wanted to thank you for all your hard work during the sale of our home at 1980 Swan Dr in Costa Mesa. We think that you did a wonderful job with everything. You sold our house in a matter of days and for an excellent price. You dealt with all the issues that arose during the course of the sale in a quick and professional manner. Throughout the process you always returned phone calls promptly and were looking out for our best interests. You and everyone in your office were a pleasure to work with. I would highly recommend you to anyone in the Costa Mesa area thinking of either buying or selling a home. Thank you so much for taking such good care of us. -I just wanted to take a moment to thank you and your staff for helping me and John Rutler complete the sale of my house. It was a pleasure working with you, and I will certainly recommend you highly to my many friends and family members who reside in Costa Mesa. -I have wanted to drop you a note, for the last three months, to thank you for all the hard work you did in representing me in the acquisition of my new estate. Having been a real estate broker for the last 22 years and with closed commercial and residential real estate sales in excess of over $2.8 billion I have had the opportunity to work with literally thousands of brokers coast to coast. I can say without hesitation, and with no referral fee required, that you are one of the best brokers I have ever had the opportunity to work with. As your are aware, I had previewed my home first and then did research to find the most active broker in the area to represent me-and there you were!! I knew you would add value in representing me in the buying process. You did, from negotiating a 7% price reduction in one of the hottest markets in the Southland to making sure all inspections, reports, and escrow documents were consummated on a timely basis no matter of the time, day or night you were “right there”. I would be proud to have you represent me on either the sell or buy side of any residential deal. Thank you once again for all your personal attention. -Yesterday, escrow closed on the purchase of a home for our son. Anne McCasland was our agent and we want to let you know what a fine job she did for us. Anne showed us a number of houses in various neighborhoods before we settled on 3216 Nebraska Place. In preparing the purchase offer, she provided helpful insights, resulting in the seller´s acceptance of our offer. She will tell you that we attempted to be thorough and read every document. We asked many questions which she readily answered. For the few that she couldn´t answer, she quickly referred us to the people who knew the answers. Throughout the transaction, she continued to offer ideas to make the process work smoothly and to assure that the relationship among the parties was based on trust and respect. She easily bridged the “generation gap”, working with our 26-year old son and us (his 60-ish parents). At every step, her approach was both professional and friendly to each of us. Throughout the transactions, she provided us with excellent service. Anne embodies the characteristics that we believe are absolutely necessary in a real estate agent. She is professional, experienced, knowledgeable, responsive and true to her word. In working with Anne, we have discovered a great real estate agent, a neighbor, a friend and a very nice person. 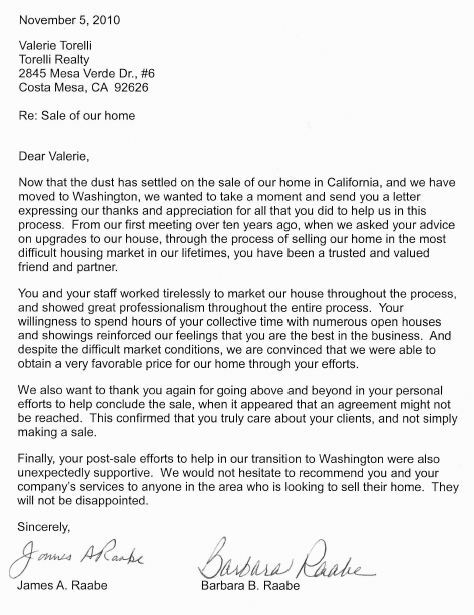 -I just wanted to write you a quick note to thank you again for the terrific service that I received from both you and your company, during the sale of my home at 1810 Tanager, Costa Mesa. Upon listing my home, you immediately had buyers looking at my home. And not only was the house sold in less than two weeks, but also you got me the price I wanted. The Torelli “team” handled all aspects of the sale of my home. From outstanding marketing and flyers, to handling the small things that most Realtors wouldn´t take time to do. Being in the business myself, (as a loan consultant), I have the chance to work with about 80 to 100 Realtors every year. It´s the small things, and attention to detail that makes the difference. Torelli Realty clearly exceeded my expectations and made the process of selling my home very easy. I would highly recommend Torelli Realty to anyone who is interested in buying or selling Real Estate. Please feel free to use my name in reference to any prospective clients.